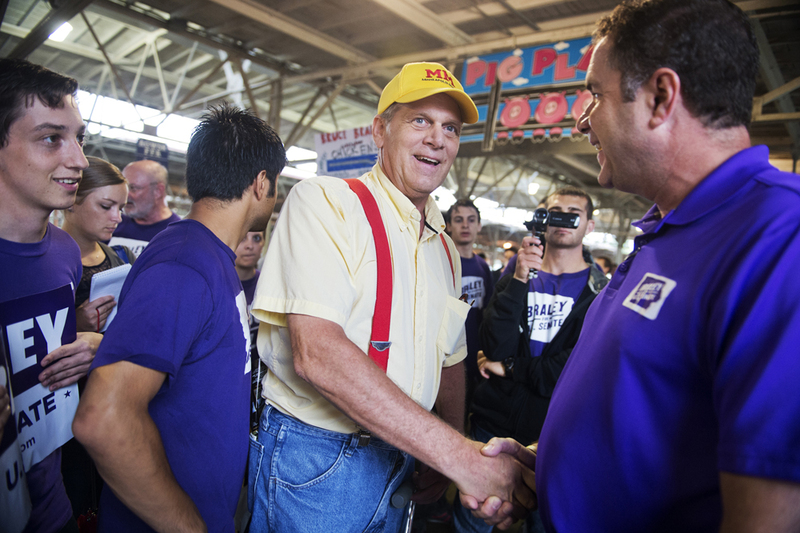 I attended the Iowa State Fair last week with Roll Call Politics Reporter Alexis Levinson to cover the Senate race to replace retiring Sen. Tom Harkin, D-Iowa. 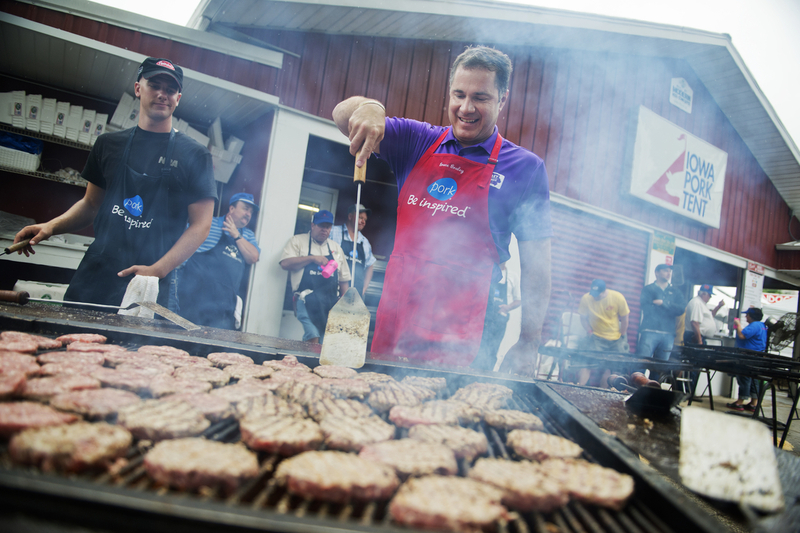 The candidates running for the seat are Democratic Rep. Bruce Braley and Republican state Senator Joni Ernst. 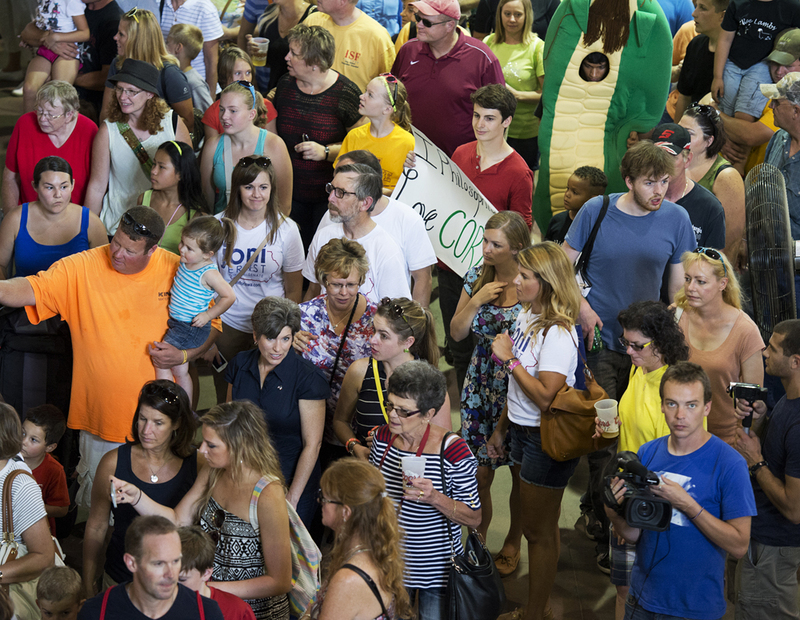 I’ve have enjoyed taking photos of politicians at the fair in the past, but it proved tricky this time with the volume of people following them. 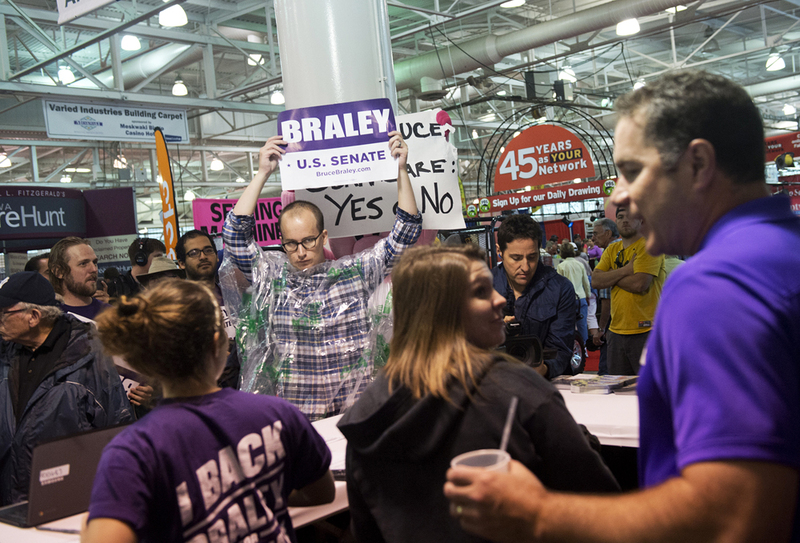 Braley delivered his stump speech on Thursday and then walked the grounds with a motley crew in tow, including: staff, reporters, filmmakers, opposition trackers, hecklers holding signs and random hangers-on. Luckily, I was the only still photographer from the media. However, if the candidate did something that would make a good picture, it was hard to get into position, and nearly impossible to exclude all the extraneous people. At that point, as a photographer, you have to try to make a photo that shows everything going on. 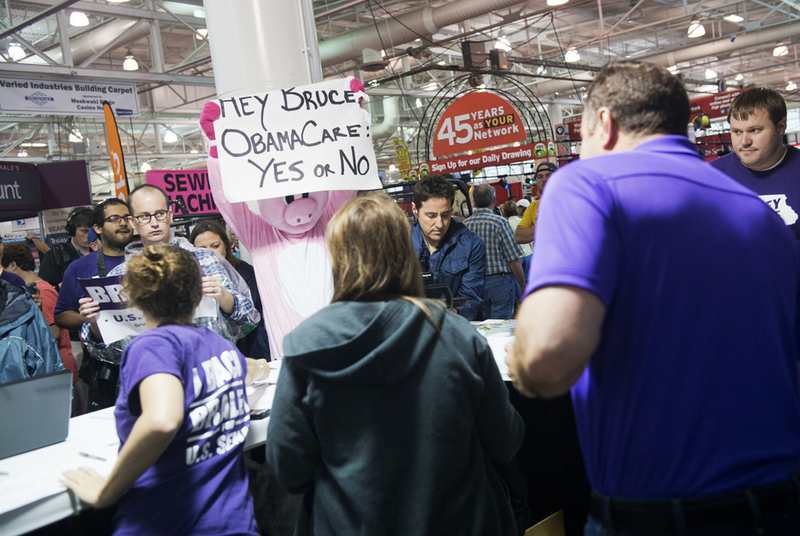 These two frames are typical of what was going on – staffers for the candidate were constantly trying to block opposition protesters and trackers. In this shot you can see the amount of staff in what is supposed to be a typical conversation with a voter. I later asked a flack about the situation and they said it was to basically run interference. I thought this atmosphere was distracting to both candidates. Instead of introducing themselves to voters, it seemed like they were just trying to get through it without saying anything that would give the opposition ammunition. I asked another flack, who wasn&apos;t working with either candidate, about this – he said he didn’t like the fair for this same reason. 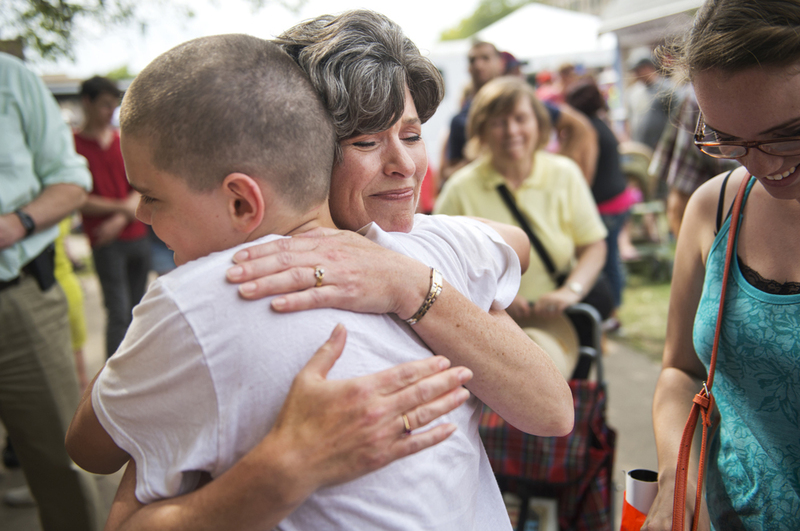 Joni Ernst had similar issues. There were opposition activists at her stump speech and one jumped in front of the media in an attempt to disrupt her. I understand that people will be heckled during a speech – when Sen. Ted Cruz spoke on Saturday, a guy told him to go back to Canada. I also understand that trackers are filming every move looking for a gaffe. 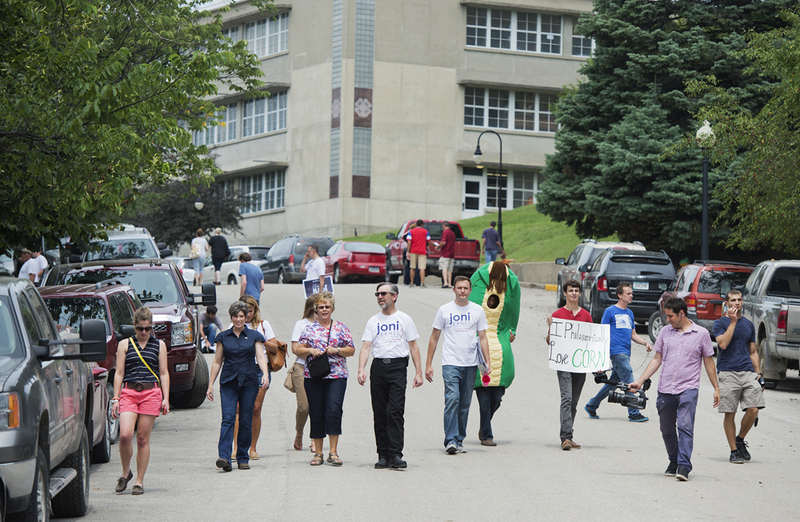 The people dressed up, walking around with signs taunting the candidate seemed over the top, but both sides had them. Was it to sabotage the campaign experience and get their message out? I’m not savvy enough to know. Here’s another shot of the whole entourage. 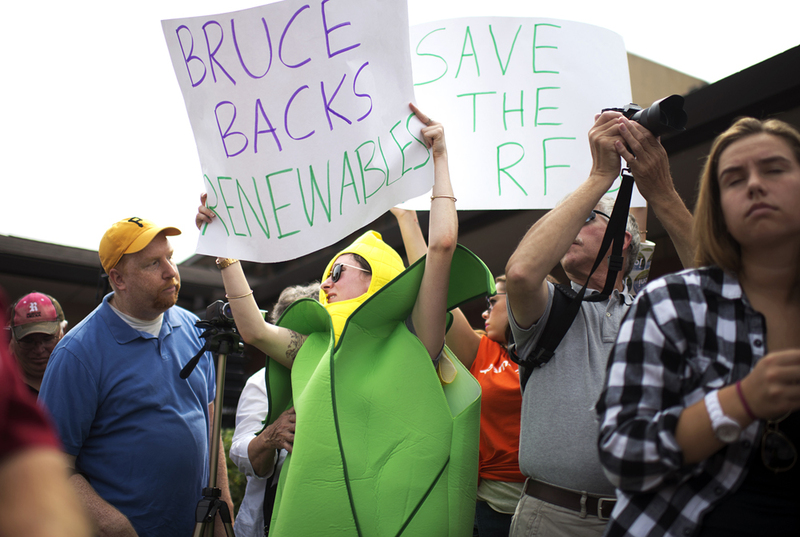 From left are: aide, Ernst, aide, two guests of Ernst, aide, corn guy, sign guy, two filmmakers and tracker. The sign guy and costume guy disappeared later in the day when Ernst was walking around with Sen. Charles E. Grassley, R-Iowa, and I was able to get some good shots of Ernst talking with voters. 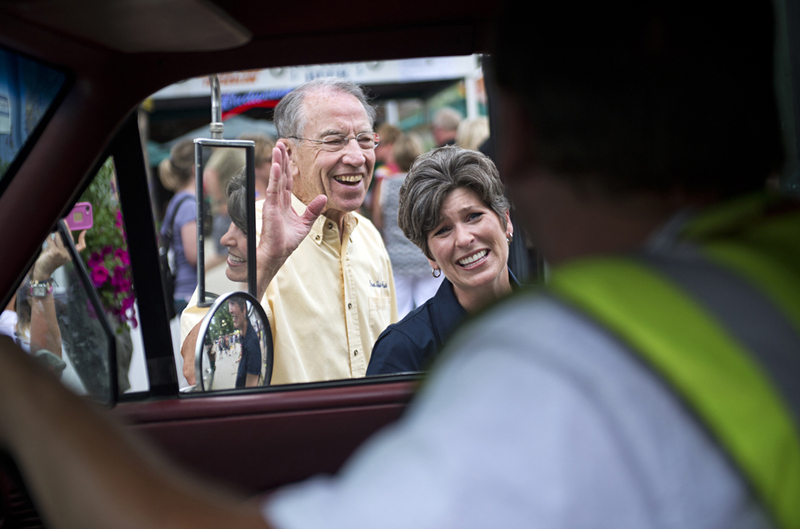 Senator Grassley was always friendly and made it a priority to introduce Ernst and Republican candidate David Young to people. I was impressed by how affable he was. He was a great wing man. I was able to get enough shots to accompany stories relating to the candidates, just not as many as I would have liked because of the chaos surrounding all the candidates. Overall the event produced good art. And it&apos;s fun to see how the candidates change from year to year. Check out the change in Braley from 2011. 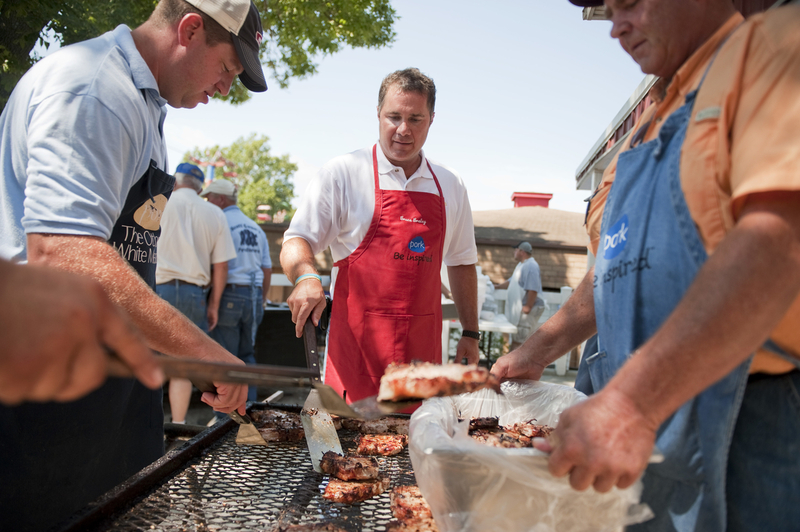 Rep. Bruce Braley, D-Iowa, helps grill pork chops at the Iowa State Fair in 2011.